I grew up in a religious home where modesty wasn’t a suggestion, it was a requirement. While having grown up and separated from what I knew as a child, I still see the benefits to modesty in clothing, and being a stylist, I respect clients who value this and want to cover up but still remain stylish. Unfortunately, though, more often than not, it’s hard to find modest, yet fashionable clothing out there. I recently went through this just this last fall, helping my 17-year-old niece find a modest dress for a Homecoming formal that came down past her knees and had sleeves. It was quite the task to say the least, even with all the free clothing samples sitting right here in my closet that I am sent on a regular basis! Clothing can be hard enough as it is, but when it comes to finding modest swimsuits. Ay yay yay. I normally refuse to even go there with clients! But that was until I recently came across an amazing line of modest swimwear- more on that in a minute! But first, lets talk a minute first about swimwear. Even if like me, you don’t find yourself concerned so much about modesty, the perks of swimwear that covers you up, has its many benefits! 1. I don’t have to tell you that most of us are not comfortable showing that much skin in public, whether we’re concerned with modesty in clothing or not. But when you shop for swimwear, you basically have three choices. 1. A two-piece bikini. 2. A one-piece swimsuit, and 3. A Tankini – involving a camisole top and shorts or bikini bottom. The third is normally the route most take when they don’t want to show the world their more intimate parts, but if you love fashion (and I know you do because you’re reading this blog!) You’ve seen all too many Tankini’s at the beach! It’s the same style over and over. So Boring, and so not what a fashionista wants to wear. As a stylist, I look for items that are new, different, unlike anything I’ve seen before, and this is almost impossible to find in more covered up swimsuit styles. 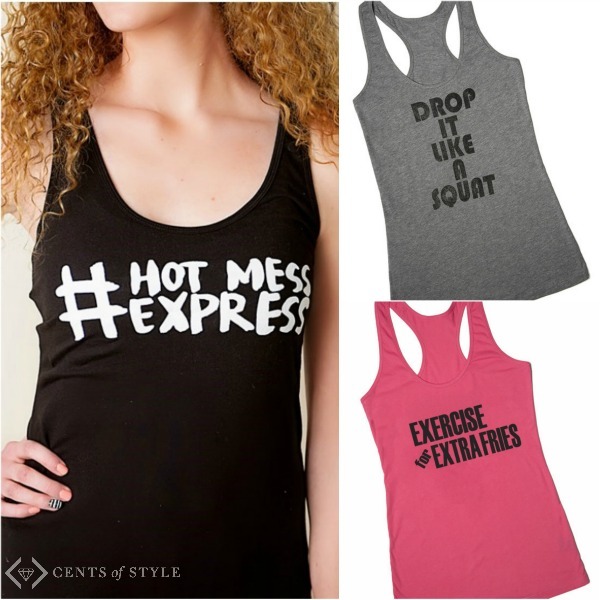 Score a Fab Deal On Some Workout Tanks! 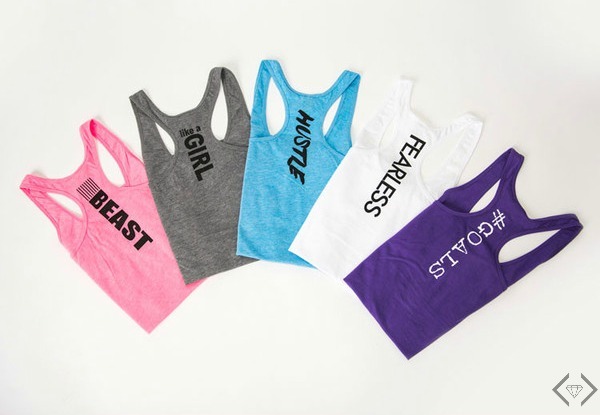 New Year’s Resolution Workout Tanks | 23 Styles (6 NEW Styles) — Look cute while you’re workin’ up a sweat in these darling workout graphic tanks! These tanks have a great fit, a nice length, and a 60/40 cotton poly blend that is so soft and comfy! Each style has a design printed either on the front, or down the back. 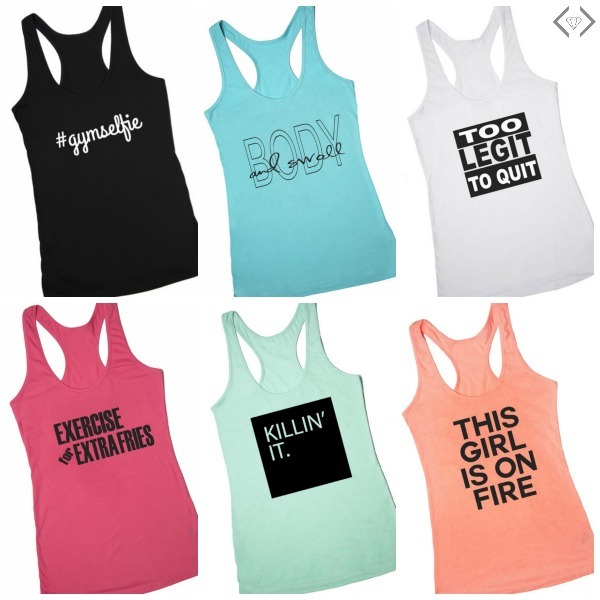 Starting today and through the weekend, you can pick up cute graphic workout tanks for 50% OFF (brings them down to $14.99) & Get FREE SHIPPING! Use the coupon code WORKITOUT at checkout to get in on this fabulous savings! Also be sure to Keep an eye out for a special deal and get some tanks for as low as $10!